“Behold this compost! behold it well! Perhaps every mite has once form’d part of a sick person—Yet behold! In our brief trip out to the Oregon coast the other day, we stopped in the town of Florence. 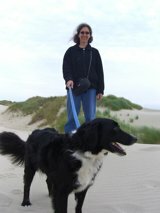 It’s the closest shore point to Eugene, 60 miles, and there are big sand dunes and wide beaches nearby. Also: clam chowder. There’s a touristy restaurant called Mo’s, part of a five-establishment chain that legend (and the company website) says started as a family operation in Newport, north of Florence, during World War II. After having our chowder and fish sandwiches, we walked around a little in the boutiquey downtown area, a few blocks of shops between U.S. 101 and the Siuslaw River. There’s a gem of a bridge that carries 101 across the Siuslaw (SIGH-you-slaw): a complex of arches and a lift bridge dressed up with Art Deco details. Leaving town, we stopped at the south end of the bridge so I could walk across, get a closer look, and take some pictures. There’s a plaque on the south anchorage that says it was completed in 1936, a project (No. 982) of the Federal Emergency Administration of Public Works, an agency that was part of Roosevelt’s New Deal plan to get people back to work by investing in public infrastructure. The plaque lists a contractor, the Mercer-Fraser Company (of Eureka, California), but not a designer. 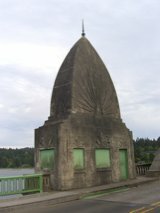 The Siuslaw River Bridge is exquisitely detailed and just a little odd. 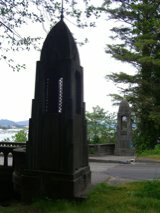 The concrete railings running its 1,586-foot length use a sort of Gothic — almost Moorish — arch-window motif. A collection of spires and towers begin at the bridge anchorages and build to a sort of climax with four massive reinforced concrete constructions guarding either side of the lifting section in the middle. Those central structures, which I’ve read were entrances to bridgetenders’ quarters, resemble giant bishops’ hats with Prussian spikes at the top; they’d look at home as an architectural detail in a Fritz Lang movie or in that dark opening Xanadu sequence in “Citizen Kane.” My artistically/architecturally/historically illiterate descriptions aside, it’s clear that whoever designed the structure was thinking about the aesthetic impact of his work as well as its function. When I got back to a computer, I looked up the bridge. 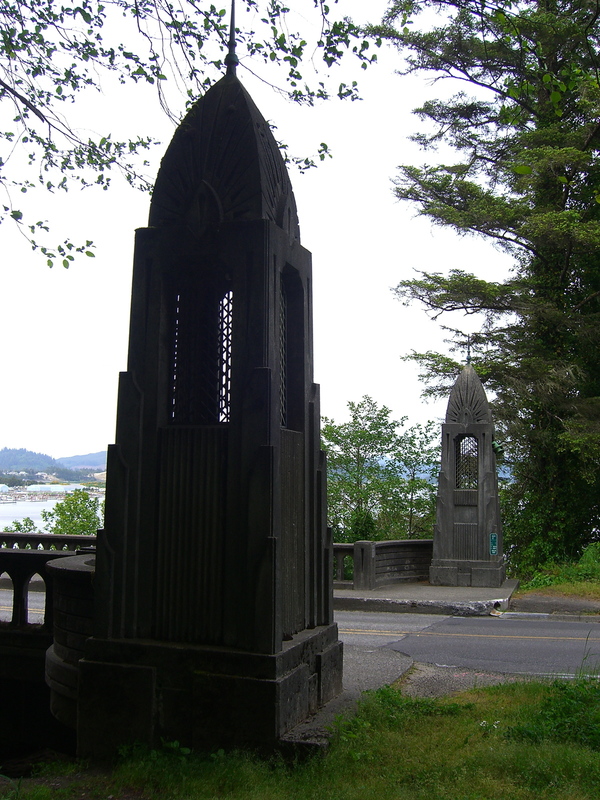 No surprise: It’s a well-known landmark, the work of Conde B. McCullough, Oregon’s chief bridge engineer from 1919 to 1946. 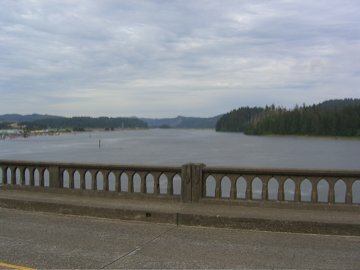 He had a hand in designing hundreds of bridges across the state, but his signature work was the series of spans, about 160 in all, he designed for Oregon’s Coast Highway. McCullough (born in South Dakota, educated at Iowa State) is a cult figure among bridge buffs. 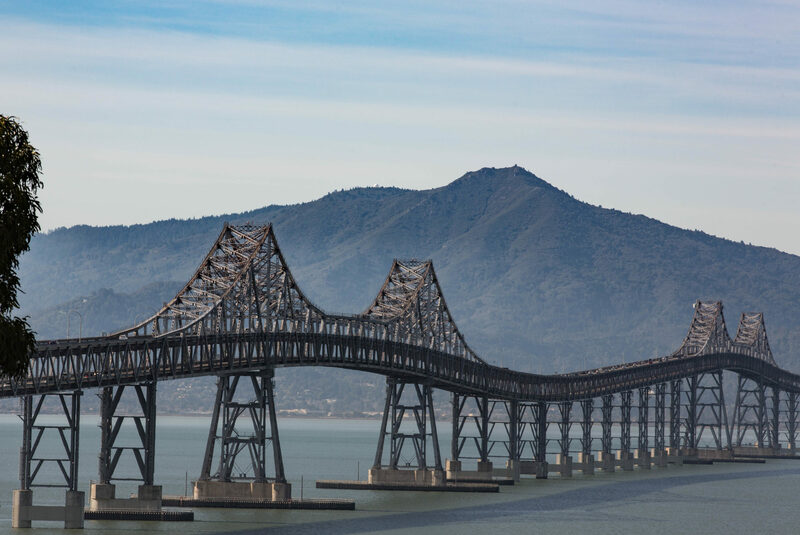 The Oregon Department of Transportation has a nice brochure on him and his coast bridges (it’s a PDF file), “Conde McCullough, Oregon’s Master Bridge Builder.” The Iowa State alumni magazine published a tribute to his work a few years ago (including a stunning photo gallery). And Oregon State University in 2001 published a McCullough biography, “Elegant Arches, Soaring Spans” (available new from OSU for $24.95 or from Amazon for $18.96). Most of what you read about McCullough focuses on his abilities as an engineer and how innovative he was using techniques and materials to overcome challenges at each bridge site. Looking at this one bridge, though, and seeing pictures of the others, I’m just as interested in what formed his aesthetic imagination, the element that transformed these structures into objects that compel you to stop and examine them. “For me, like most other Americans, Memorial Day is a time for barbecuing, playing Frisbee, loading up coolers with iced beer, and getting out of town. I usually don’t think about America’s war dead on the last weekend of May any more than I think about our nation’s independence on the Fourth of July, or about the birth of Jesus on Christmas. 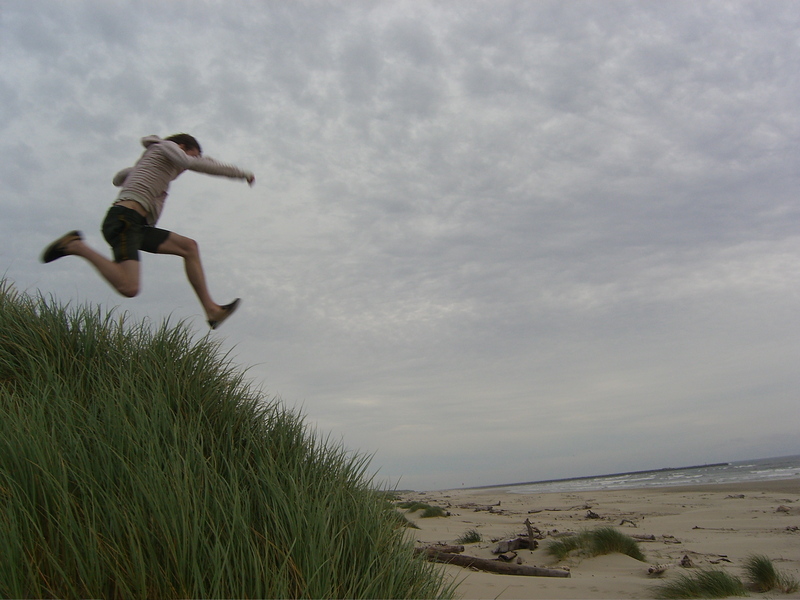 Thom, airborne near Florence, Oregon. 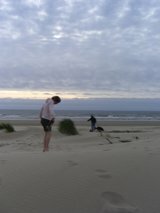 Kate and The Dog and I drove up to Eugene for the weekend, and with Thom we drove out to the coast — 60 miles from Eugene to Florence — for the afternoon. We wound up out at Heceta Beach, just north of Florence. The PBS NewsHour aired a nicely done report yesterday on the much publicized estimate by two noted economists that the Iraq war may ultimately cost the United States up to $2 trillion. The segment did a good job breaking down and explaining the estimate, published by Columbia’s Joseph Stiglitz and Harvard’s Linda Bilmes in 2005 and 2006. Where the report was lacking, perhaps, is discussing what the cost might mean down the road, though it did point out that the money we’ve spent already on Iraq, nearly $430 billion as of this moment, would have paid several times over for rebuilding every school in the United States or would have made a nice down payment on the “unsolvable” problems with the Social Security system. Opponents of the congressional effort to attach an operational timetable to new funding for our Iraq War and World Improvement Project (IWWIP — trademark pending) have long since adopted a catchy label for the proposed troop withdrawal schedule. Led by the likes of John McCain, the critics condemn timetables as setting a “surrender date” in the war. McCain and the critics have one thing right: It’s messy for Congress to step into managing the war this way. But there’s nothing unconstitutional or unprecedented about it — in fact, the Constitution gives Congress the power and responsibility, by way of its control of funding, to participate in warmaking decisions on the people’s behalf. The “no surrender” types apparently would continue to cede their power and responsibility to an executive who has proven careless and arrogant in its exercise. The timetable critics’ alternative — to continue writing blank checks and waiting for the executive’s current plan, or the next, or the one after that, to work — is an extension of the same plan that’s killed thousands of U.S. troops, tens or hundreds of thousands of Iraqis, and laid waste to a place that was supposed to turn into the Eden of Mideast democracy. The “no surrender” types speak of the awful consequences of leaving Iraq “before our work is done.” What I’d like to hear someone in Congress talk about is the awful consequences of surrendering again and again to a president who ignores both the lessons of experience and the clear voice of his people. On NPR this morning, a brief feature on the family of Andrew Bacevich, a young Boston University graduate and U.S. Army lieutenant killed last week in Iraq. His death drew special attention because his father, also Andrew Bacevich, a former Army officer and military and diplomatic historian at Boston University, is both conservative and a penetrating critic of the Iraq war. ” ‘One of the things that I’ve been really struggling with over the last several days is to understand my own responsibility for my son’s death,” Bacevich said. “Bacevich says he thought his responsibility as a citizen was to give voice to his concerns about the war. His loss, he says, has made him question the lasting value of his criticism. Salon has a sort of interesting piece today on documents from the Coalition Provisional Authority (our original occupation government in Iraq, starring L. Paul “Jerry, here’s your Medal of Freedom” Bremer). A Case Western Reserve political scientist discovered some weekly reports from 2004 that still contain all the official edits and deletions. The Salon story cites one remarkable passage: in retrospect, an extended piece of wishful thinking about the insurgency cooling off in al Anbar Province. The CPA appears to have deleted the rosy speculation immediately after insurgents, mobs, or whoever it was killed four U.S. paramilitary contractors in Fallujah, an event that signaled the fact the province was entirely out of government control. Of course, the embassy might be ignoring all the good news, too. Here’s an item I like: Three teachers in Oakland have been forced to resign over “clarifying” a question for a student taking California’s high school exit exam. For now, let’s not get into the subject of the testing mania that has taken root in public education as a method of leaving no child behind and holding teachers and schools accountable for making sure kids are learning what they need to learn. Instead, just consider the nature of the incident: A school administrator witnessed the “clarification” and ratted the three teachers out. No details are forthcoming yet about what the student asked that prompted the “clarification” or what help the teachers offered in response; all that’s known is that the teachers will lose their jobs and the test results for the students involved may be invalidated. Crikey. We’ve got an attorney general who won’t accept responsibility for anything happening on his watch and who would probably tell you he can’t remember if you ask whether he’s wearing underwear or not. He’s just the latest line in a long series of lying, bumbling Bush higher-ups who have disgraced their offices, screwed up the jobs they were given, and won the undying gratitude of their boss. On occasion, they have blundered so badly that the president has had to send them out the door with a handshake and a Medal of Freedom. Not to worry — they all come back with books telling us what great jobs they did, what a refined sense of duty they share, how clear their consciences are, and how everyone else let them and us down. Somehow that’s all tolerable, judging by the fact the rascals are conducting business pretty much as usual and the torch-carrying mobs you’d expect on the streets have yet to appear. But teachers who might have helped out a kid on a state test? They’ve got to go. We can’t let anything interfere with the integrity of a system set up to provide a fig leaf for the criminal lack of concern for what happens to kids in the worst schools or for why those schools are so bad in the first place.